Chemawa Indian School dates back to the 1870's when the U.S. Government authorized a school for Indian children in the Northwest. The official philosophy at that time was to integrate the Indian population into general society through education. 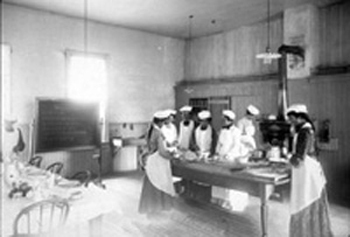 Two Indian schools were in operation on the East Coast. A site was chosen at Forest Grove, on four acres of land rented from Pacific University. Lt. Melville Wilkinson of the U.S. Army and secretary to General O.O. Howard was in charge of the project. $5,000 was provided to start the school. Lt. Wilkinson, with the help of eight Puyallup Indian boys began construction on the buildings in 1880. The initial class of students consisted of fourteen boys and four girls. All the students came from the State of Washington, seventeen of them from the Puyallup Reservation on the Puget Sound and one boy from the Nisqually Reservation. These students were taught blacksmithing, shoe making, carpentering, wagon making, girl's industries and advancement in studies. Prior to 1883, Congress was going to appropriate a larger amount of funds for Chemawa school. Several factors led to the search for a new site for the school, including local resistance to the school, a need for more land to teach farming skills, and the destruction of the girl's dormitory by fire in 1884. At this point, officials looked at the temporary leased nature of the land as well as the poor drainage and began considering alternative sites around the Willamette Valley. Three sites were donated for the new school. Newberg offered 100 acres of heavily timbered land, 23 acres near Forest Grove with a pasture parcel of 75 acres approximately four miles away from the main site, and 171 partially cleared, sparsely timbered land in Salem served by a spur of the main railroad through the Willamette Valley. School officials chose the Salem site since it was close to the State Capital and had the most acreage. In 1885, the school moved to a site five miles north of Salem and began construction. The first buildings were made of wood, and were later razed to make way for more permanent brick structures. On June 1, 1885 the Chemawa Indian School was opened with approximately half of the students moving to the new location and half stayed behind in Forest Grove. On October 1, 1885, Mr. John Lee became superintendent of Chemawa Indian School (then known as Salem Indian Training School). After a winter of separation, and after staff and students finished construction on three new buildings on the campus, he withdrew the remaining students from Forest Grove and reunited them all on the Salem campus. The first graduating class completed the sixth grade in 1886. Subsequently, courses were added through the tenth grade. 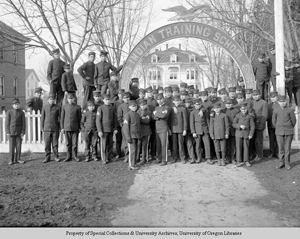 In 1900, Chemawa had 453 students, the largest of it's kind in Oregon with a federal budget of $57,182.62. The emphasis at that time was on vocational training. The 1913 report lists farming as one of the major areas of training. Dairying, stock raising and other farm methods provided food which was preserved by the students for later use. A school library provided reading material and students could participate in basketball, baseball, and football. There were 690 students enrolled with 175 Alaskan children. By 1922 there were 70 buildings on the 40-acre campus. Most of the buildings were wood frame, but some of the newer were of brick construction. The land area of the school had grown to 426 acres. Some of the land had been purchased by Indian students and given to the school as a token of their gratitude, with the money earned by picking hops. The year 1926 saw the peak enrollment at Chemawa; almost 1,000 students were enrolled. The 11th and 12th grades were added to the curriculum and all grades below the 6th were dropped. In 1927, Chemawa became a fully accredited high school. In an economy move the school was threatened with closure in the early 1930s, but due to the efforts of interested journalists and Oregon's Congressional delegation, it remained open with 300 students. The 1940s and 50s brought other changes, including a special program for Navajo students and changes in policy to bring back Northwest students, particularly those from Alaska. In the late 1970s, Chemawa moved to a new campus on adjacent land, with most of the original brick buildings being destroyed. Chemawa Indian School is currently over 125 years old and is the oldest, continuously operated boarding school for Native American students in the United States. While its mission has changed some over the years its highest goal has always been to educate Native American students for the world outside. Recently the school has embarked on a more rigorous mission to help students reach the highest goals and achieve the most that they can in their life after high school. This is complemented by the help of the IHS clinic located right on campus, the AVID program, which seeks to help under served students with access to higher level classes and college entrance requirements, and the Chemawa Partnership Program with Willamette University which brings so many enthusiastic college students to the campus to interact with Chemawa students.